Construido como una fragua en la década de 1970 el edificio original se convirtió en una espaciosa casa bien ventilada, con grandes ventanas que traen la belleza del jardín maduro. A minutos de la ciudad en autobús o en taxi, o un par de millas a pie a lo largo del río, la casa es la perfecta combinación de tranquilidad y el acceso a la ciudad de Guanajuato. Ideal para los que ya están familiarizados con Guanajuato o que tienen tiempo para relajarse y disfrutar de la ciudad y sus alrededores. 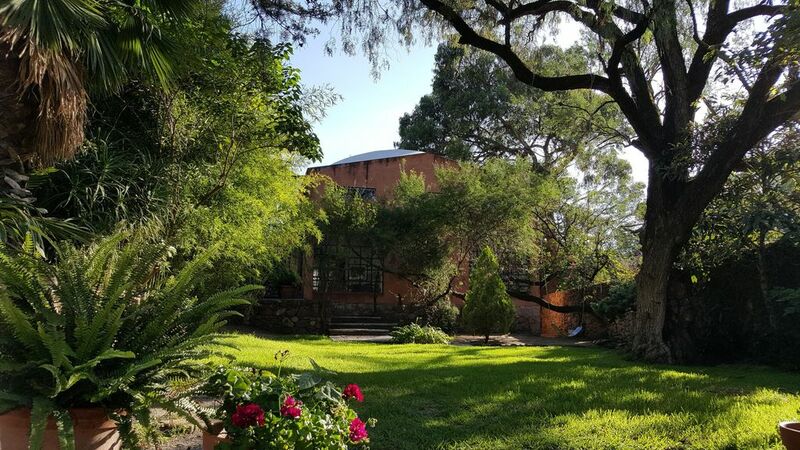 Situado a orillas del Río Guanajuato, donde haciendas tradicionalmente el procesamiento de plata fueron, la casa está en una gran cantidad inusualmente grande. De ahí nuestro hermoso jardín. La casa es muy acogedora y muy singular debido a sus dos enormes techos de bóveda. Cada uno de 25 pies de ancho! Por todas partes hay es el exterior que entra por las ventanas enormes. Habiendo dicho que la casa es muy privada de la carretera, siendo completamente amurallada. Tres millas fuera del centro de la ciudad, que cuesta 40 pesos ($ 3) para saltar a la ciudad o 5 pesos para tomar el autobús a Alhondiga. Tenemos una familia fantástica que han estado cuidando de la casa todo el tiempo que hemos poseído. Carmen, nuestra criada, es una pequeña, sal de la tierra tipo de mujer que siempre está feliz y cantando. Ella es una alegría para tener alrededor y una excelente cocinera! Raquel, su hija, se encarga del jardín y caretakes la propiedad. Las zonas de estar / comedor / cocina tienen un plan abierto sentir debido al techo de 30 pies, mientras que el de arriba y el dormitorio principal tienen un acogedor, ambiente más íntimo. Perfecto para leer o disfrutar de una película. Cada cama se completa con un edredón edredón de plumas y las camas de arriba tienen acolchados de espuma de memoria, tan cómodo como te gustaría que en tu propia casa! Nos encanta cocinar y entretener, así que debemos encontrar la mayoría de las cosas que hay en la cocina. Siéntase libre de utilizar cualquier cosa que todavía está en la despensa. Nos encanta esta casa y esperamos que usted también! El servicio de limpieza por nuestra camarera Carmen incluido una vez por semana. Usted puede organizar una limpieza adicional, lavar, cocinar con Carmen directamente si lo desea. Thank you Roselia for your wonderful review. I'm so glad you and your family enjoyed your stay. And I totally agree about Rachel and Carmen. They have been with us for years and are truly a part of our family. I will let them know how impressed you were with them. We would love to host you again. Estamos aqui para servirle. Gracias. The interior of the house is lovely, comfortable, and well appointed. There are a number of spaces where a family or two couples could relax and enjoy their time within easy access of Guanajuato. Getting into the city is easy and safe by public bus for $5 pesos. There are a couple of decent restaurants in Marfil with the more “local” restaurants providing the best value. The property manager was very helpful and kind. She greeted us with fresh flowers, local coffee, and chocolates. She has a number of good suggestions and is very knowledgeable about the area. While appearing safe, the location of the house has a few drawbacks, at least at the time of year we stayed (three weeks bridging February to mid-March). It is located on a dusty road, beside a small, slow moving river. Both the road and river are littered with trash. Walking along the road is often unpleasant because of the dust created by passing cars. There is no other "green area" within walking distance of the house so each of several daily walks along the road with our dogs was a chore. Most local dogs are not friendly. The other side of the property is bordered by a major road (on the other side of a tall stone wall) so most times of the day the street noise is quite muted and at night the property is quiet. Depending on your disposition, the near constant presence of one or two caretakers/gardeners on the property may be seen as off-putting or not. This has nothing at all to do with the friendly and helpful nature of these long-term employees – more whether you are comfortable with the presence of others for six or so hours on most days, with somewhat unpredictable hours. Given the positives of the house we would likely stay there again but would try to understand and negotiate in advance more limited hours that the caretakers would be on site. Bright, comfortable, spacious inside and out. We invited friends for dinner and it was an ideal entertaining space. Short walk to 2 excellent museums and a short taxi ride into Historical Centre. Dust from the road and smell from river in the evening took a bit away from the experience but overall we would recommend this house. Well equipped, well cared for by the delightful Carmen and comfortably furnished. Couldn't be a better place to enjoy Guanajuanto. Just wanted to tell you we've really enjoyed our first week in your beautiful house. We're so pleased with Marfil, the lovely lawn and gardens here at your house; we made the right choice. Love your house, the space, the boveda arched ceilings, the windows and all the light, everything. We've driven a few places, San Gabriel hacienda, the mummy museum and we've taken the bus into el centro twice. What an interesting town it is and very friendly. As we rode home on the bus one afternoon, we passed the Museo de Momias, and everyone on the bus was worried that we had missed our stop, and pointed it out to us, and wondered if this wasn't where we wanted to go. We love Carmen. She's a gem. She cooked Chicken Mole one evening for us. As many times as I've had that dish in Tucson, Denver, and San Miguel and elsewhere, I've never tasted better Mole sauce. Better than any restaurant. Carmen and Raquel seem to get along pretty well with our critter, Fergus and it's just great we can leave him out in the yard while we're gone and not worry about him. We enjoyed our stay tremendously. We three elderly women spent the month of February in this beautiful house and had a great time. The staff (Julie, Carmen and Raquel) were very friendly, welcoming and always ready to help if we encountered a problem. Once a week, Carmen cooked us a delicious meal and showed us how to wash the vegetables and fruit from the market with “gotas para desinfectar”. Raquel taught us the art to open and close the lock of the front gate with the antique key. Evenings and mornings were still cold in February, so the two gas heaters came in handy. It was wonderful to sit on the terrace looking at the magnificent garden. We ate our meals there under the two umbrellas and lounged on the double day-bed in the sun. We enjoyed the local Marfil scene: buying bread in la Panaderia, fresh vegetables and roast chicken in the small stores that line the main street. We walked along Camino Antiguo by the river to the beautiful Ex-Haziendas, Casa Museo Gene Byron and San Gabriel de Barrera. Unfortunately the path can be dusty and the river tends to smell during the dry season. It was easy to get to the center of Guanajuato by taxi, or by bus for only 5 pesos. We made excursions to St Miguel and Dolores Hidalgo taking a bus from the “Central des Autobuses” which is only a few minutes taxi drive away from the house. We have some issues: It was not always possible to get a connection from the landline telephone. So we relied on our cellphone. We found that the doorbell was not working well and missed a visit from a friend because we could not hear the bell. Although Julie had sent us a plumber who fixed one of the taps in the main bathroom, half a day later it started dripping again. We could not prevent that the bathroom floor flooded while taking a shower. Looking back at our stay, we found it a pleasant experience and would recommend the property to others. The photos in the ad give the correct information. The people running this house are very nice and accommodating. The house is in a good location for access to Guanajuato, either driving, bus, or taxi. Note the taxi fare has gone up, now about $50 pesos. It has a nice outdoors space with comfortable furniture, both inside and out. Prospective renters should note that although this house is advertised as three bedrooms, it really isn't. There is a large room upstairs with a low dividing wall that has three beds in it, no privacy like one would expect in a "bedroom," i.e., no door or walls. Also, the downstairs bedroom has no curtains on the large glass door that opens into the house, nor curtains for the large window overlooking the property. So, basically, no real privacy for any of the bedrooms. The "beautiful gardens" could be that, except they are unkempt and largely overgrown. I find this is often the case here in Mexico when there is no real gardener tending the gardens. Our real issue, besides the lack of privacy, was the situation with the keys. There is only one key for the front gate. The caretaker kindly gave us hers so we had two keys for three couples. Also, it is not possible to lock the gate from the inside so that it can be opened by the key from the outside. There is a latch that is not key operated. So, if one couple is home and latches the gate, the couple that is not home cannot open the gate. The bell was not able to be heard in the house. Also, there is one different key for every door. This was inconvenient but workable. Mostly, the problem was being locked out of the property until we were able to get the attention of the people in the house to come let us in. Overall, we would not stay here again. The property was clean and beds comfortable. But the lack of privacy was a deal breaker. For one couple, it wouldn't be a problem though. Thank you for your comments! We try to be as clear as possible about the open floor plan, so I´m sorry it was not clear before your arrival. We do take all our guest´s comments seriously, and will certainly address the obstacles you encountered with us. Thank you, again. I hope you enjoyed Guanajuato! Situado a pocas millas de Guanajuato Centro, Marfil se encuentra a lo largo del Río Guanajuato en una zona de antiguas haciendas. Nuestro vecino, el Club Campestre Nepomuceno (club de campo) está construido en las ruinas de una de estas. El área fue devastada en la gran inundación de 1905 y fue comprado y restaurado por el arquitecto italiano Giorgio Beloli. Muchas de las casas de esta zona fueron construidos por él y muchos contienen ventanas creadas en nuestra casa cuando era una fragua. Por ahora, probablemente, usted ha leído mucho acerca de la gran ciudad de Guanajuato, la vitalidad y la cultura de la ciudad es lo que nos mantiene trayendo de vuelta. Si estás de visita en la ciudad por sólo un par de días y quieren ser parte del bullicio y el ruido, nuestra casa no es probablemente para usted, pero si vas a venir a disfrutar de la ciudad por un poco más de tiempo lo más probable apreciar la tranquilidad de Marfil como un lugar para regresar y descansar después de un día o de noche en la ciudad !. Please note that a 2000 pesos refundable damage deposit is required upon arrival. For rentals longer than 2 months the rate can be reduced, depending on number of guests, and with guests paying their own utilities.